If ya don't mind me asking, what material do you use for the face? I've been wanting to make a detailed partial using something similar to clay or leather that would be sturdy enough for a head. I used worbla over a 3d printed base, but cast resin bases work just as well. I want to try using worbla a bit more in the future, seems like it has much potential for scales! Ah, so this is a fursuit? I gotta say, I'm pretty impressed with the talent furries have for suit making. I like the idea of having a suit, but I'm no furry. The suits just look fun. Love the heavy scales on this. Great work. Impressive work! I'll have to take a thorough look at your gallery. thanks. I probably won't do mask commissions like these for the forseeable future, but I'll probably open for the simpler style leather ones some time semi-soon. what are the leather design ones? foam-based head? I was thinking of using instamorph plastic, but I'm not quite sure. 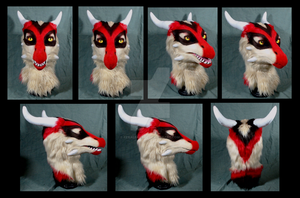 I'd be adding scales up the bridge of my dragon's nose over some thin fabric, go it wouldn't touch the foam. Thanks! I've never tried adding scales to foam, all of the heads I've made have had hard bases. I think it could possibly still work though, if you're not covering the entire head in scales. I used something similar to instamorph for some of the scaly bits on this head, and it's pretty nice to use. I've used instamorph a few times, it is pretty useful. I need the scales to be a dark blue or black, so I may either get a colored instamorph/thermoplastic or just dye it.